5 Easy Steps = How to Clean Grout with Vinegar and Baking Soda! 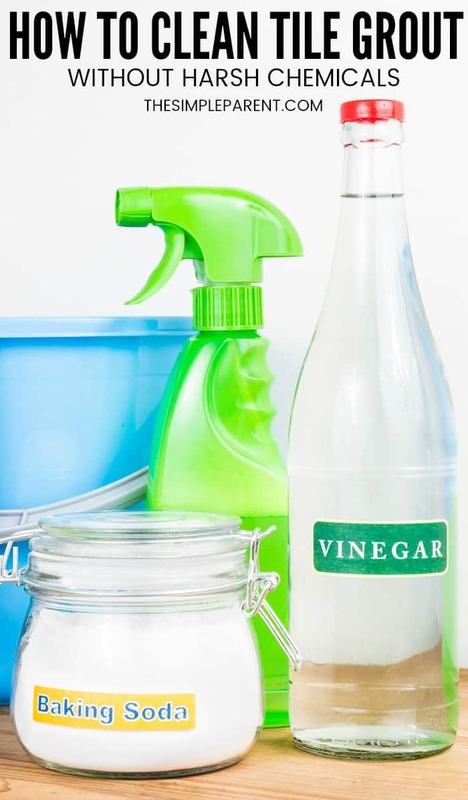 Home » For the Home » 5 Easy Steps = How to Clean Grout with Vinegar and Baking Soda! 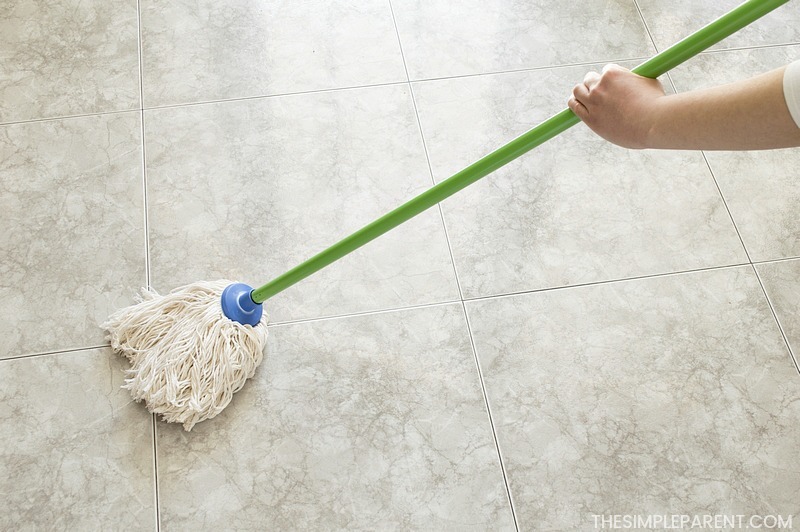 Want a quick way to clean your tile floors without separate cleaning products? Learn how to clean grout with vinegar and baking soda! Most of us have a few things in our kitchen at all times. Basics like flour, sugar, baking soda, and vinegar come to mind. What you might not realize is that some of those items are powerful cleaners too! They can turn a challenging cleaning task like tile floor grout into one of the easiest things you’ve done later! No matter how often you mop your tile floors (whether they’re in the kitchen, in the bathroom, or throughout the house), there comes a time when the grout needs to be refreshed. It’s not something I’d ever thought much about until one day when I realized that no matter how often I cleaned the floors, they didn’t seem as clean as I thought they should! That’s when I went on a hunt for the best homemade grout cleaner. 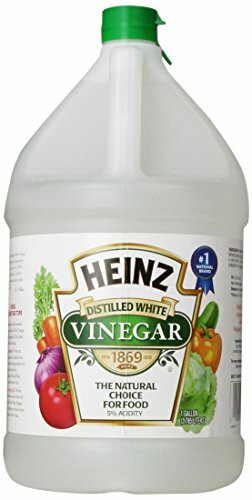 I’ve done my fair share of using vinegar to clean around our house so cleaning grout with vinegar made a lot of sense to me! If it’s worked on other things in my house, why not the tile grout? To get started, you just need to grab the baking soda and vinegar out of the cabinet! You’ll also need some water, a bowl, and perhaps an old toothbrush or other scrub brush (for any really stubborn areas of grout). If you’re ready to learn how to clean grout with vinegar and baking soda, there is one simple thing to remember. It’s the key to success! It’s all about making a paste! The paste is the key to making this an easier cleaning job! By easier, I mean less elbow grease and scrubbing. If you have miles of dirty looking tile in your house (like I do in my kitchen and laundry room), you will want to minimize scrubbing as much as you can! That’s the secret. It’s all in the paste. Follow these easy steps to success on your tile floors and even tile in the bathroom shower or tub area too! 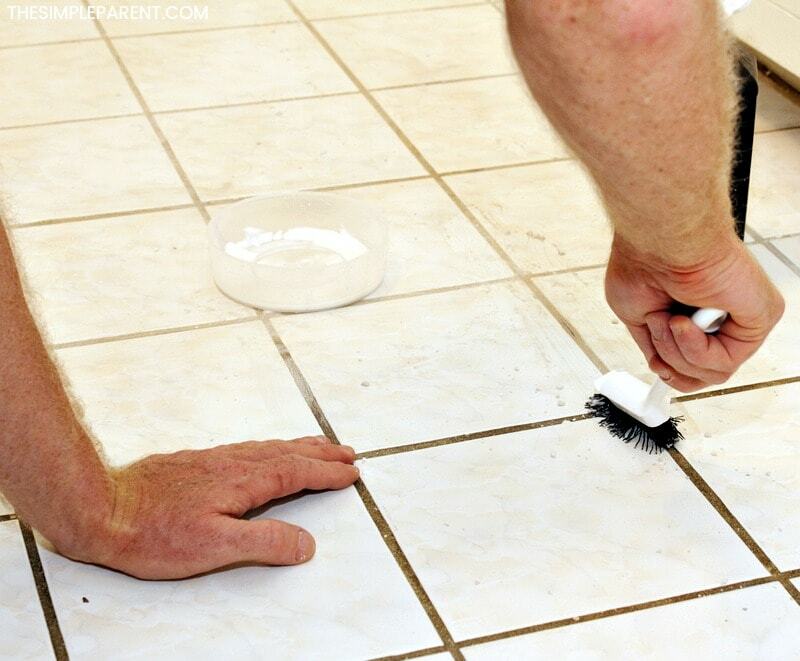 Spread the paste in a generous layer along the area of grout you’re cleaning. Now, I won’t lie and say you’ll never do any more grout scrubbing. That’s just not the truth. If you have some really stubborn areas, you might find that scrubbing really helps. If you’re like me, you might not be able to resist doing just a bit of scrubbing! Old habits die hard, I guess! But for the most part, I haven’t had to scrub the grout if I make a thick paste with the baking soda and vinegar! The last time I did this, I even knew some cleaning was happening because the paste turned a little bit darker as I let it sit. It started turning gray so I knew something good had to be happening! Cleaning tile floors with vinegar and baking soda is my secret to keeping them looking bright and fresh! It works well in the bathroom if you have tile around your tub or in your shower. When I’m doing bathroom tile, I do find that my paste can be a little bit thinner than when I do the floors. I think the bathroom grout might not get as much dirt ground in. So don’t be afraid to play around with the mixture! It’s easy to figure what works best for your floors with just a bit of experimenting! If you’re looking for more cleaning tricks, learn how to remove permanent marker from almost anything! After seeing it on Pinterest again and again, I had to give it a try! My husband did some serious scrubbing on our bathroom grout (I am currently out of commission). We are very pleased with the results, having used the paste and an old toothbrush!! Then mopping the entire floor with clear water to remove the Soda grit. Do you have suggestions for keeping the grout clean longer and naturally? 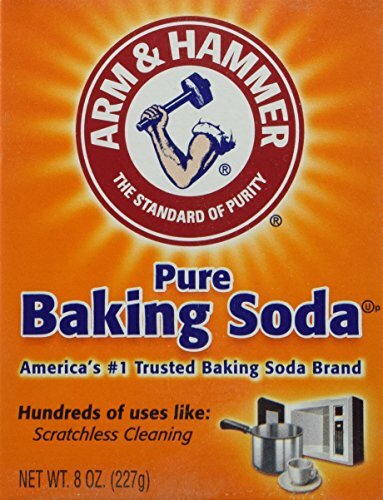 Another great use of the Baking Soda and Vinegar: Each time I discard a Fridge/Freezer deodorizing box of Baking Soda, I pour it into a sink drain, then splash some white Vinegar and watch it fizzle while it does the work of freshening the pipes. I believe this has helped keep the old drains working. Ok, to be honest, I didn’t think your floors were that bad and didn’t expect to see much of a difference in the before and after photos. But WOW, what a difference!! You need one of those large pushbrooms, you know, like you would use to sweep out your garage or something. Mix up a whole bunch of paste in a bucket, poor it on, and use the pushbroom to push it around and scrub. You could probably do it with a mop as well, but it wouldn’t have as much scrubbing power as something with bristles! Good luck! Thanks for the great tip, Brandi! I really didn’t want to do the entire kitchen and laundry room with a toothbrush. But I love the difference so I want to clean it! I just tried it and it is the biggest mess EVER I think I will have baking soda grit on my floor forever. And the grout is still not perfectly clean. The same happened to me! Huge mess! How did you get it off/up? Great post! Yes, I like cleaning grout with vinegar and baking soda, because first of all, it is natural, no chemicals . which means its free of harsh odors that sends us into choking spells. It also saves money, because we have these ingredients in our kitchen, and there’s no need to buy a commercial cleaner from the store. 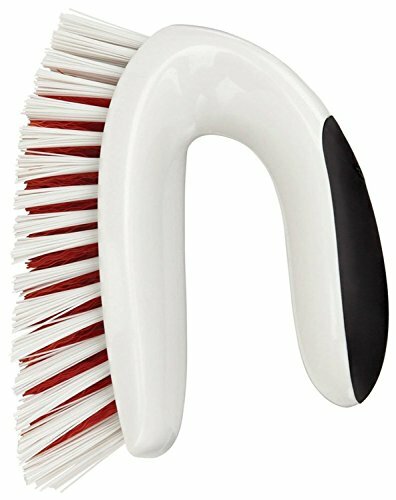 Most importantly, it disinfects and kills germs, whitens the grout, and makes it sparkling again. Thanks for sharing your post! White vinager and baking work great in fiberglass showers too. Spray walls and floors with a even mix of hot water and vinager, sprinkle on baking soda and let sit for 10 min. then scrub. The tile grout color in my kitchen is pale yellow, but most of the time, it’s brown. I clean the floor weekly, but it looks like the grout will never get its original color. Your recipe seems to work great. I’ve never thought about scrubbing the grout with baking soda and vinegar. Thank you for the idea! Great, great tips! Thank you! After cleaning uPVC window frames I use a good car wax to polish them up. I have also tried this on tiles/grout (NOT floor tiles, obviously) and the grout stays cleaner longer as the polish repels the water. Try it. Love the results! Also love the use of in-home products.